A boarding team assigned to the Combined Maritime Forces’ (CMF) Combined Task Force 150 (CTF 150) has rendered medical assistance to several injured fishermen. During a routine visit by the crew of CTF 150’s flagship, FS Somme, to a Yemeni dhow it became apparent that several of the crew members were suffering from minor injuries. Somme’s doctor was transferred to the dhow to help treat the fishermen, and was able to provide advice on how to best manage the individuals’ injury at sea as well as providing initial treatment. 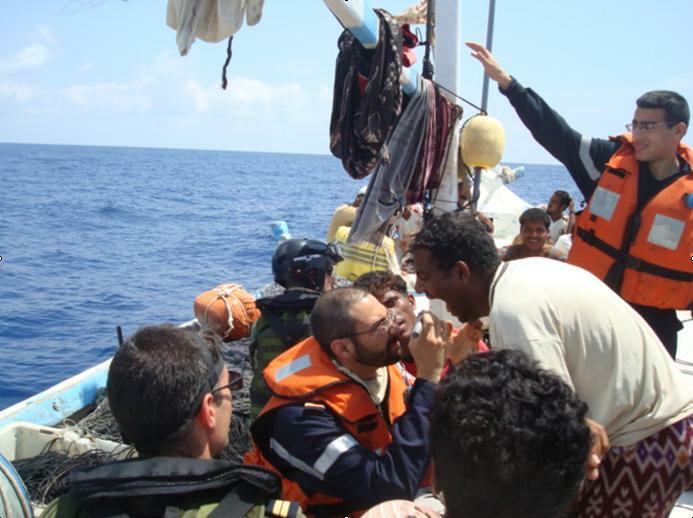 FS Somme’s doctor provides medical assistance to the crew of a Yemeni dhow. The Somme boarding team also provided the crew of the dhow with fresh water and food, as well as distributing protective work gloves, sunglasses and emergency contact information for the maritime security forces operating in the area. Approach and Assist Visits are a key part of CTF 150 operations, and allow the ships and sailors of the Task Force to gain valuable insight into the local area. They also help build the trust and relationship between the CMF and mariners on the high seas. CTF150 forms part of CMF and works with other agencies to coordinate maritime security operations across their area of operations. Its principal remit is the disruption of illicit activity and promote security, stability and prosperity in the Northern Indian Ocean, Gulf of Aden and the Red Sea.